- Try to avoid cramming too much in a small space, even though this one has plenty of options for 'play' , I'm not entirely sure it's realistic at this size, if it was a couple of feet longer in a similar configuration, it might work. I think for the amount or points you have, it leaves some of the tracks rather short, and it appears you have little space to run around a train, perhaps a car or two at most, that might just be the angle of the pictures perhaps. -I know this is just an experiment, but I would for your final plan, use larger/smoother points, this will probably mean less of them, but overal appearance will improve and trains will run better. Don't let that put you off however, by all means have a play, experiment, see what works for you, and take your time. If you find you get a lot of gratification and above all, FUN, out of it, by all means build it! I'd still consider using the two boards you have (making 12') for an HO switching layout. Have the track plan above, and just stretch everything. The loop becomes able to hold a good few cars, and the industry leads will take 2-3 cars, and still have some empty track on the approaches, even when occupied, which looks far more realistic. But if you do it, don't be tempted to cram in more sidings- just let it flow more. I'm with the others about spacing it out. and especially using bigger turnouts. Those Hornby ones look like about number 4s and for good reliable running, especially when you get the larger box cars and gondolas, you should be using number 6s or 8s. They look so much better as well, but they do reduce your loop and spur capacities. For good running, though, it's worth it. The big danger are the reverse curves or S curves which can cause derailments. The track and wheel standards are finer than Hornby track, so the stock is usually a bit more sensitive than your standard UK stuff. The standards we apply are minimum number 8 turnouts for main line tracks and number 6 turnouts for spurs. Then it starts to look more like a railroad and less like a toy train. I think changing your plan to include the staging area is a good idea. To get the most length for it I would consider making it a sector plate, no turnouts so the full length is available for trains, even a few tracks gives you some stock ready to run, one can be kept clear as a switching lead. 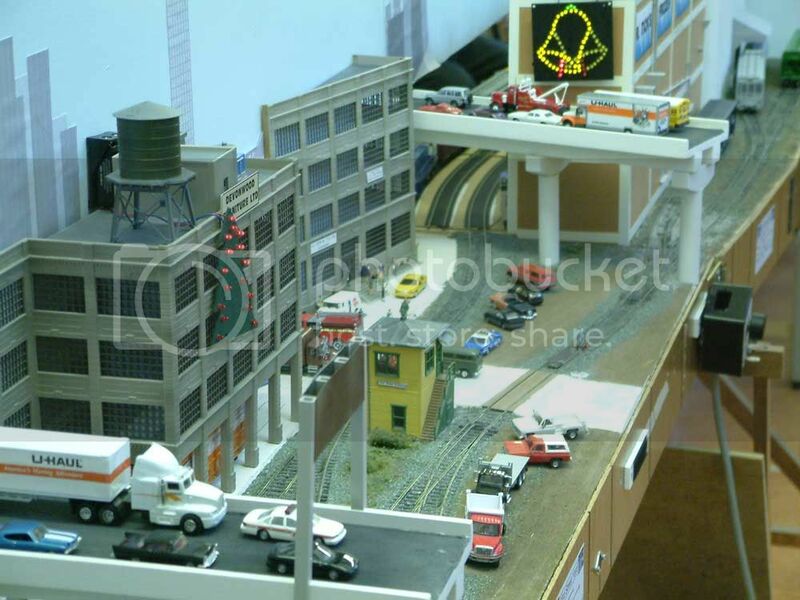 Another consideration is to have one track in front of the storage yard that is a scenic part of the layout. Here is one of my old exhibition layouts. The flashing lights were for a December exhibition! The sector plate is in the middle behind the buildings. The tracks to the right gave two more industries and more switching. You can hide it with buildings, trees or leave it open. The track can be industries or a switching lead. This was a good layout to run by myself for a whole exhibition. My only other thought is let the rear left track run along the back of the layout with some building flats behind it rather than staying parallel to the lead. I believe they are pretty reasonable models. They can still be further enhanced by additional details etc, but mechanically they are sound. switcher1 wrote: Does anyone know if PROTO 1000 HO 31244 MKT #20 BUDD RDC3 LOCOMOTIVE & PROTO 1000 HO 31254 NYSW #M-1 BUDD RDC1 LOCOMOTIVE are good models? I have the Rock Island version, runs OK but it is long and does require a minimum 24" radius curve, if not greater.